MOSCOW (AP) — Russian President Vladimir Putin, known for his passion for the outdoors, showed off his softer side during a visit to China when he sat down to play the piano Sunday. Putin is in Beijing on a state visit to discuss a $1 trillion infrastructure plan that strives to revive the ancient Silk Road. After speaking at the summit in the morning, Putin headed to meet Chinese President Xi Jinping at his residence. Putin is habitually late for meetings, but this time he was the one who was made to wait, Russian news agencies said. 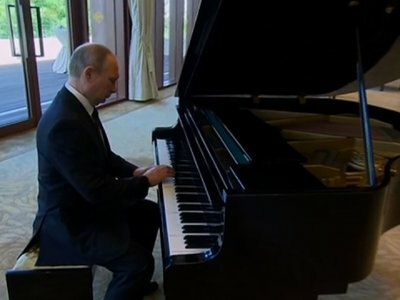 So, Putin played some songs on Xi’s piano. Russian state television showed excerpts of at least two tunes he played — “Moscow Windows” and “City on the Free Neva” — both Soviet classics. But in recent years, Putin — occupied with the annexation of Crimea, the crisis in eastern Ukraine and Russia’s role in Syria — preferred to demonstrate his virile side in Kremlin-distributed pictures of him hunting and fishing.